Zombie Mommies: Masque of the Red Death: Anyone else thinking Darth Vader mouth pieces? Masque of the Red Death: Anyone else thinking Darth Vader mouth pieces? Review: Plagued with guilt over her twin brother's death, Araby tries to escape her subconscious at the Debauchery night club. Outside the entire world is broken. The "weeping sickness" is only kept at bay through porcelain masks (I can't help but imagine "Darth Vader" type mouth coverings), worn only by the wealthy and prestigious. Araby's father is the inventor of these masks and as Araby's world begins to crumble by those that seek power, she must decide who or what she's capable of fighting for. Based on the short story by Edgar Allen Poe of the same title, Griffin took an idea and grew it into a fascinating and complex story. This is one of the very few, if only, steampunk stories I've ever really held onto. Carriages that run on steam; new inventions with a feel of the 19th century. The world is spot on for gothic dystopia: dark, dreary, foggy...so Edgar Allen-painted with so much imagery and feeling that I could clearly picture the devastation and turmoil. Also, try saying debauchery without getting the chills. But what really struck me were the characters. Talk about complex. To explain, let me refer to a post I came across by Laurie Halse Anderson in which she discusses characters who have dimension and depth. 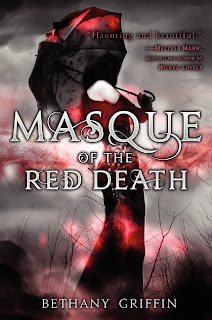 Masque of the Red Death is a perfect example of those characters. Araby, Will, and Elliott all behave both admirably and despicably. Which if done poorly can make a reader go crazy but here Griffin balances their character traits so that you realize no one is absolutely good or absolutely evil. Mind you, there were some parts that made me go "huh?" but for the most part, it kept me on my toes. At times I couldn't help but wonder if given the choice, what I would decide. My only discontent or puzzlement I have with the story is that the "Red Death" is not introduced into the plot until much later. I was a bit confused because I thought the masks were to prevent the "Red Death." I'm not so much bothered that it stopped me from enjoying the story but I think it would be an interesting idea to discuss. 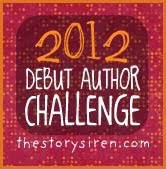 If you are in the mood for a dark and captivating story, check this one out. I definitely think it's one to put on your to-reads shelf.